The Docklands had been a major part of London's, and by extension Great Britain's, trade and wealth for centuries, before their use became unsustainable. As each company moved out, and the warehouses became empty shells, many of the families of the surrounding areas became unemployed, spelling death for the area. It wasn't until the late 1980s before real steps were made to improve the area. 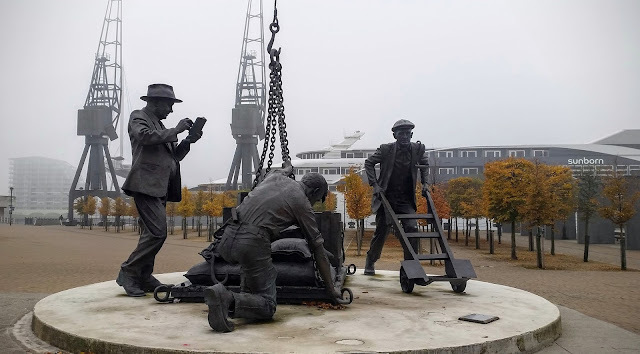 Housing, new businesses, a City Airport and new transport links, like the Docklands Light Railway, and the transformation of the docks with a new exhibition centre, really brought the area back to life. The Royal Docks Trust and Newham Council were persuaded to commission the statue by John Ringwood and Patricia Holland, wife of Patrick Holland who had worked on the docks for 20 years. Mr Ringwood and Mrs Holland had been campaigning for a memorial to Newham's Dockers for many years. The statue, which was cast in bronze by the Bronze Age Sculpture Casting Foundry, was installed in March of 2009, with an official unveiling on August 24, 2009.